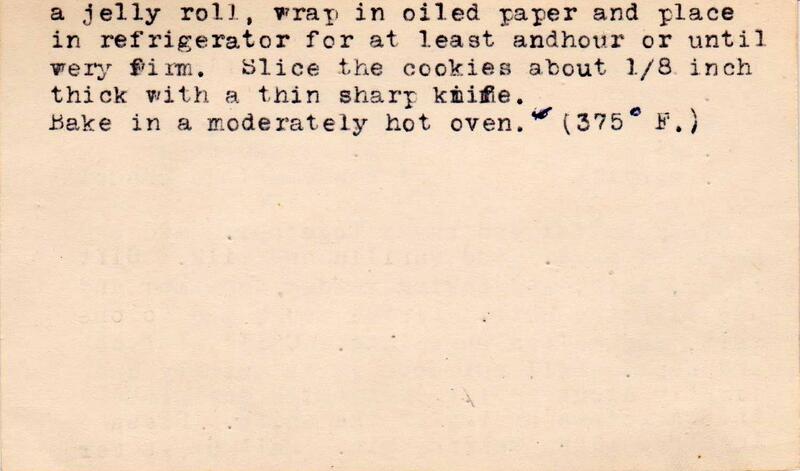 I was looking for a 1960s era dessert for Mad Men devotees, and this one fits the bill. Though you may not be able to complete these in time for tonight's season premiere, unless you start RIGHT NOW -- these cookies require at least two hours to firm up in the refrigerator. 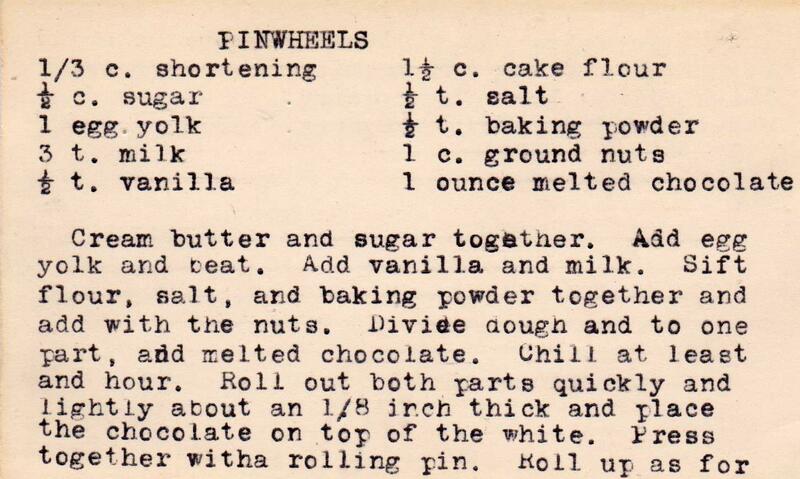 Pinwheel cookies, as you might imagine, are a bit labor intensive. Betty wouldn't tackle them, but might direct her household staff to whip up a batch. Trudy Campbell might make them; I can certainly picture these on her dining room table. Below is *some* of the mis en place. Even though one should measure out and prepare all ingredients before starting a recipe, I never do. Usually, it's fine. 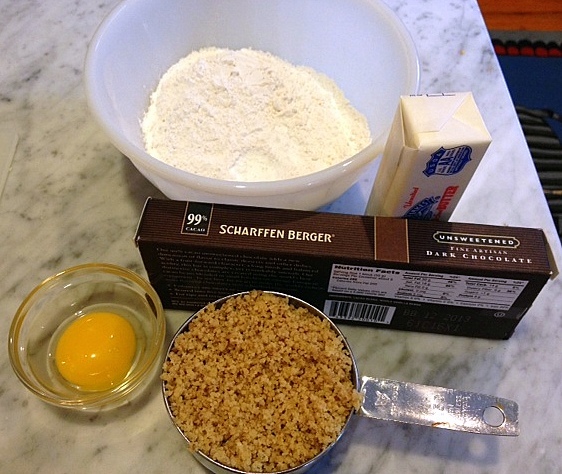 Beat the butter and sugar, then add the egg yolk. When combined, mix in the nuts and flour. 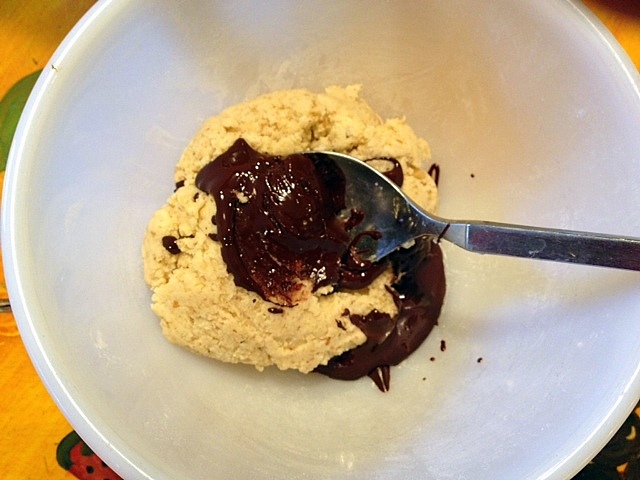 Divide the dough in two portions and add one ounce of melted chocolate to one. Et voila, as Megan Draper would say. Refrigerate for at least one hour. 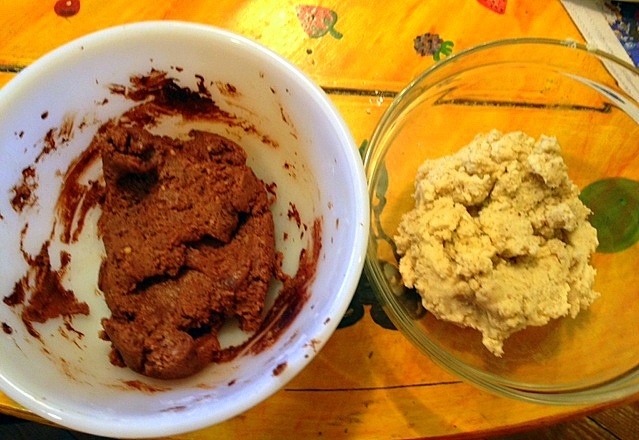 Next, roll out each dough and then place the chocolate atop the white one. 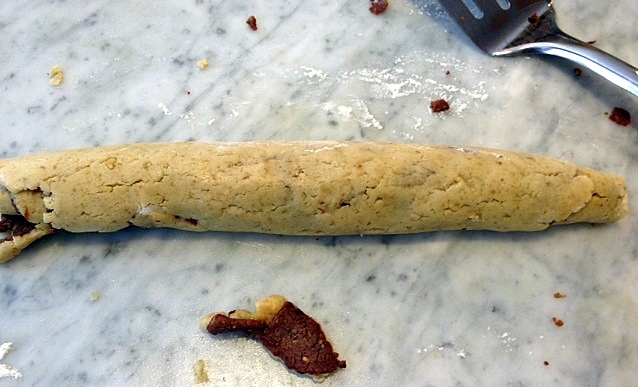 Run your rolling pin over this to combine. Roll like a jelly roll, staring from the long end. It won't be perfect, at least mine wasn't. I strongly advise eating the scraps. 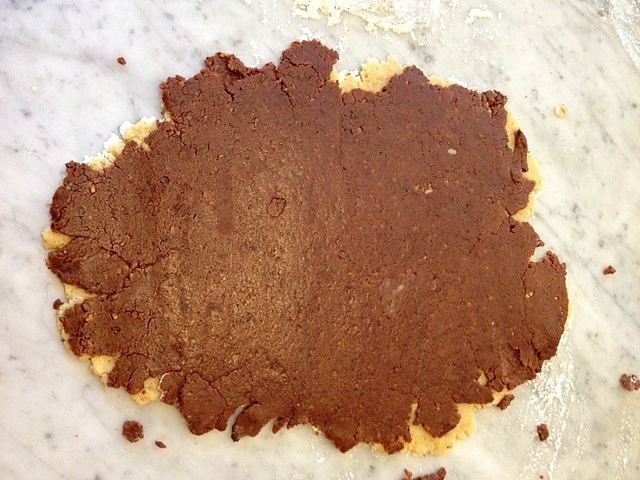 Cut the roll with a sharp knife, so you have something that resembles the cookie below. 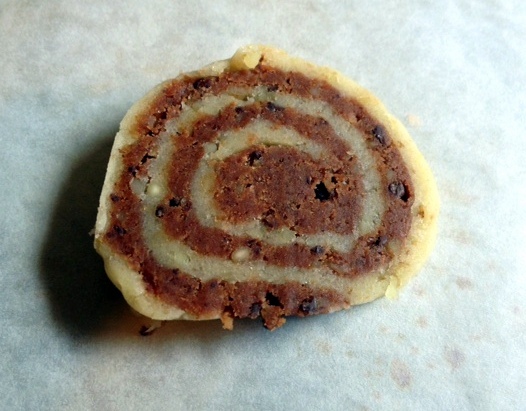 Place on a parchment-lined baking sheet; they can be fairly close together, as they don't spread much. Bake for about 11 minutes. Bon appetite! Recipe below. 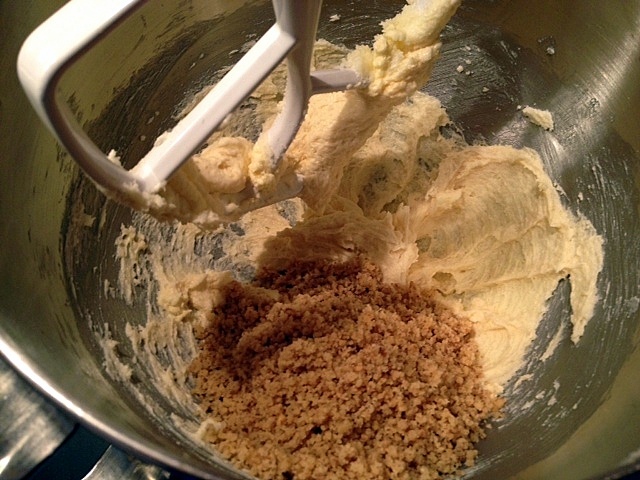 Some production notes: I used butter for the shortening and walnuts for the nuts. This makes about 36 cookies. I baked them for about 11 minutes. Yum! 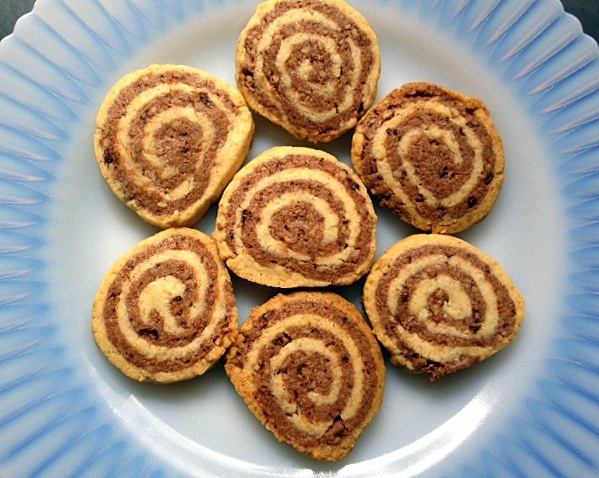 My mom always made "DATE PINWHEEL COOKIES"
Yummy! these cookies are beautiful and delicious! Totally lovable, and so superbly done! Somehow I missed these. I remember my mom buying these (well, not these) in the grocery and they had pink sugar around the outside. We always tried to nibble that part first before biting into the cookie. These look great and if I make them I promise I will roll them in pink sugar before baking. And I don't watch Mad Men so I will have to do these myself! I made these yesterday -- they were a hit with my boyfriend, but I could have gone for a touch more sweetness or a slightly richer shortbread flavor. I had plain shortening on hand for another recipe (for which I couldn't substitute butter), so I used that here, and I ground some almonds for the nut component. The dough was quite crumbly after the addition of the dry ingredients, so I added a half teaspoon of vanilla and a bit more milk to adhere everything. I found the cookies to be a bit bland on their own (maybe due to the lack of butter, or my nut choice? ), so I drizzled a tiny zigzag of melted chocolate over each one. 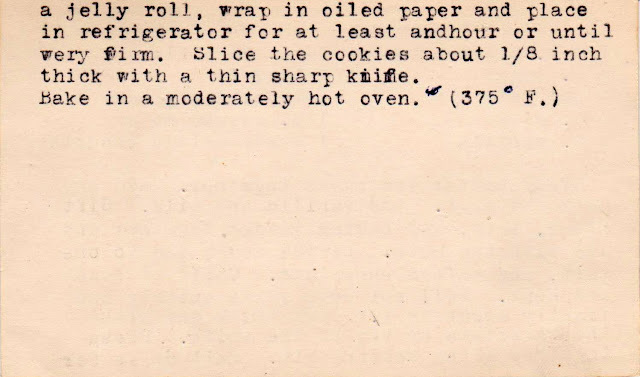 As a historical side note, my grandmother and her gang of friends called themselves "The Icebox Cookies" (and "The 9 Js") when they were in high school in the '40s. I thought of her while I was making these!